Every year, millions of dollars of value left on New York City subway cards goes unused; lost or discarded by commuters. MetroChange allows users of the New York City subway system to donate the small amounts of unused value on their Metrocards to charity, before that value is lost or discarded. 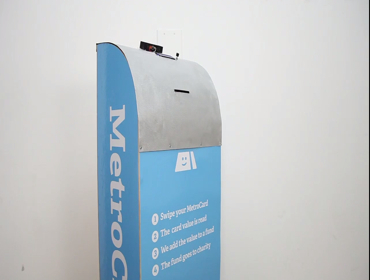 The commuter swipes their Metrocard at a MetroChange kiosk, the value of their card is read. The value of all these donations is matched by our partners and donated to charity each month. MetroChange turns all commuters into philanthropists, twice a day.